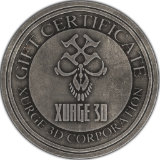 Xurge 3D Gift Certificates make the perfect present. Let them choose exactly what they want from our wide selection of 3D models. Gift certificates are good on any item(s) at our web site, except for the purchase of other Gift Certificates. You can send certificates to friends and family immediately (via email), or print them yourself to include in a card. HOW IT WORKS: Upon the completion of your order (within 24 hours), you will receive an email directly from our website with your certificate code (it is in email form only... we do not mail you an actual paper certificate). You can either use the certificate code yourself, or email it or print it out on paper for a friend or family recipient.